Instead of a resolution, choose a word that describes what you hope for the new year. maybe it's LOVE if you want to work on your relationships, or DO if you want to challenge yourself to something, or LAUGH if you want to lighten up, etc. I'll start by saying sorry the photo is so bad. I had a really hard time getting the embossed tree to show up. Add A Little Color To Every Day..that is what I want to do more of this year. Weather it be in my card making or whatever else I may be doing. 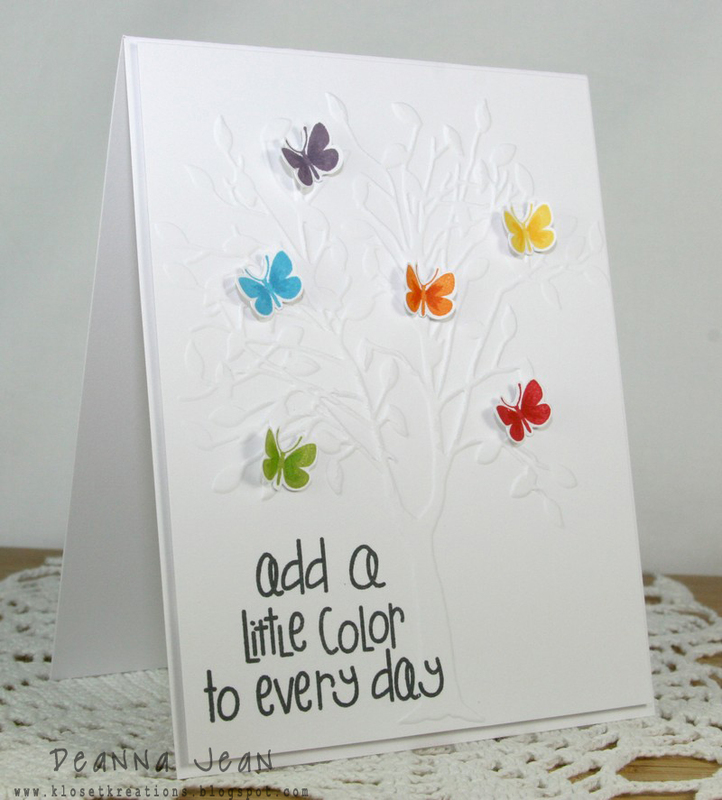 a simple and stunning card...love all of the colors of butterflies and super sentiment. Gorgeous card - the embossing is so peaceful and calm like the butterflies, but their colour really makes it pop and come to life. Well done! Hey Deanna! Love your barely there tree with all the butterflies hanging out there. Great sentiment for your year too. Hope things are well with you, and that you had a wonderful New Year! Thanks for joining the CAS-ual Fridays Challenge! This is so cute and cheerful! Your card made me smile!!! Umm...this is awesome. I love your word choice and I LOVE this card! So pretty! Thanks so much for playing along with us over at CAS-ual Fridays!